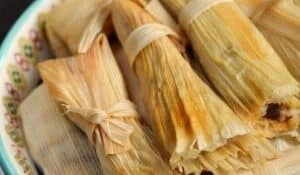 I have had found a new monthly challenge, but it no longer exists so I am deleting the unnecessary portions of this post. 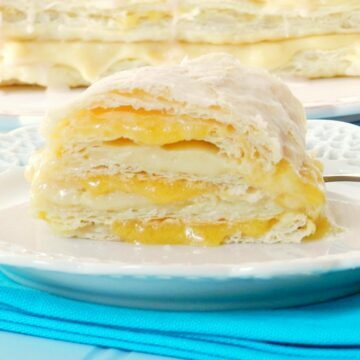 This month theme is Peaches n’ Cream so I decided to create Peaches and Cream Napoleons! 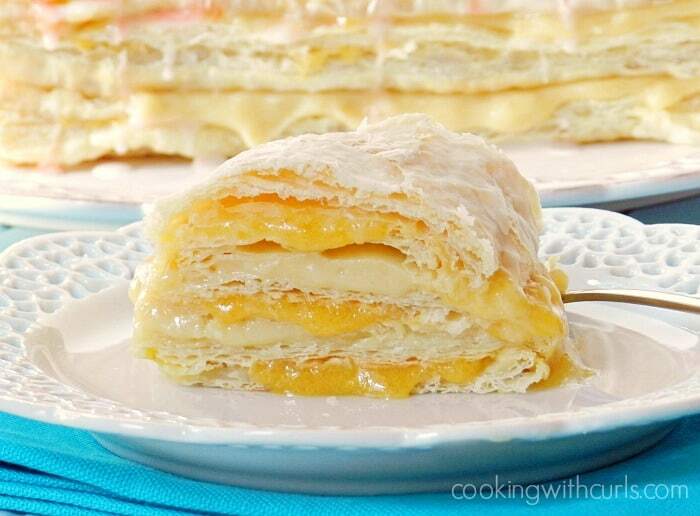 Napoleons were always one of my favorite desserts growing up, along with Cream Puffs and Eclairs….. I thought about making Cream Puffs for this challenge, but wasn’t sure how well making Chou Pastry would go over…I didn’t want to scare anyone away! I opted to keep things simple for my first challenge…packaged puff pastry sheets…..
they puff up so nicely in the oven. Okay disclaimer time…Pepperidge Farm Puff Pastry Sheets contain less than 2% High Fructose Corn Syrup…..something I am completely opposed to. However, they are dairy-free…so it is a trade off 🙂 I also do not have any other options here in Iowa, and I was not in the mood to make puff pastry from scratch! Combine peaches, sugar, and vanilla in a saucepan and cook over low heat for 15 to 20 minutes until they form their own syrup and peaches soften. Blend peaches with an immersion blender or pour into a regular blender. Allow to cool completely before using. Combine the milk and vanilla in a small saucepan, and cook over medium heat to just below boiling. 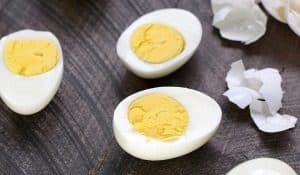 Add the egg yolks and beat thoroughly with an electric mixer. Slowly add the milk to the flour mixture and whisk to combine. 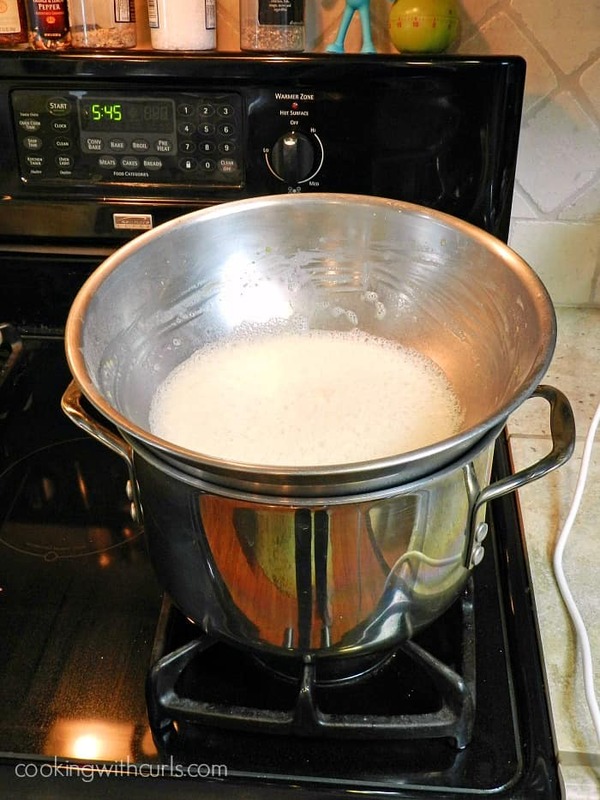 Heat milk mixture over boiling water (double boiler) stirring constantly until the custard is thick and smooth. Allow to cool completely before using. Unfold defrosted pastry sheets and lay on a lightly floured surface. Cut each section along the fold and place on a parchment lined baking sheet. Bake in a preheated 400 degree oven for 15 minutes, or until golden brown. Allow to cool completely before using. 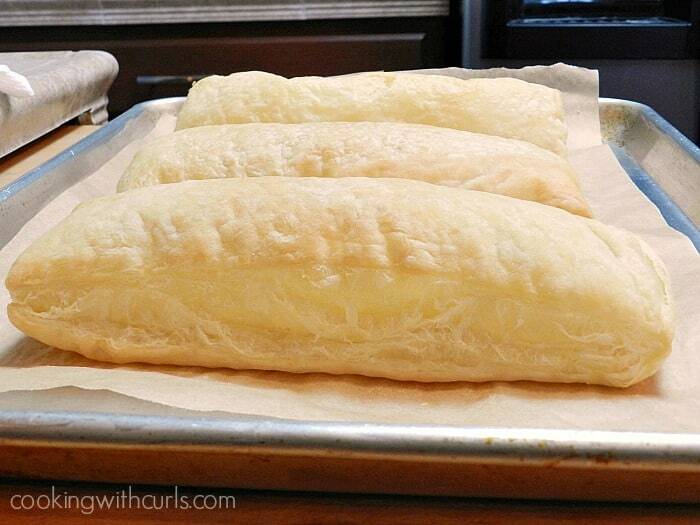 Split each puffed pastry sheet in half to form two layers. Set all six layers aside. Spread peach coulis over one of the bottom layers. Place a layer on top of the peaches, and spread with pastry cream. 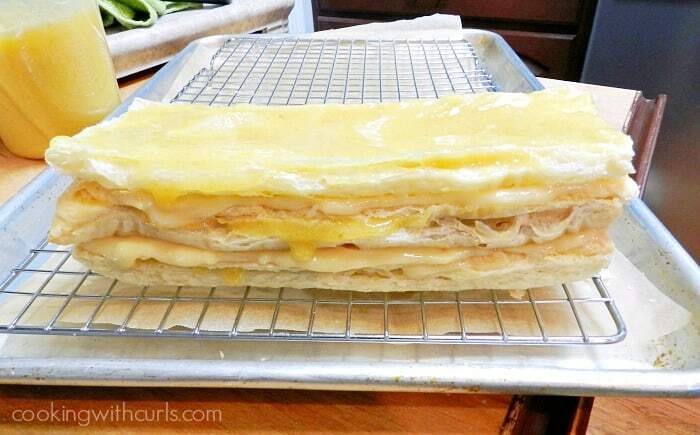 Continue layering pastry sheets, peach coulis, and pastry cream until you have five layers total. Whisk together the powdered sugar and milk. Pour glaze over top pastry sheet layer. 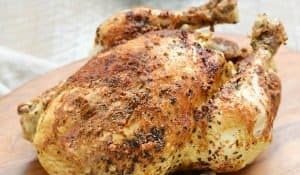 Place in the refrigerator and allow to chill for at least one hour before serving. Peach Coulis is a fancy word for peach sauce. If you do not have fresh peaches, or the desire to cook down your peaches, feel free to substitute a jar of peach preserves. It is worth the effort though. The custard layer is a standard “cooked” pastry cream recipe. The steps are very similar to the ones used to make the Chocolate Cream Pie, but this version is vanilla. I used my handy stainless steel bowl with a pot of water trick for a double boiler again. I really see no point to purchasing an actual double boiler when this works so well! If you have ever seen Napoleons in a bakery, you may have noticed the chocolate design on the top. I tried to recreate the design with food coloring, but it was a disaster. You may notice the strange peach markings in the photos…..just ignore those 😉 I am really happy with the way these turned out, and I hope you give them a try! 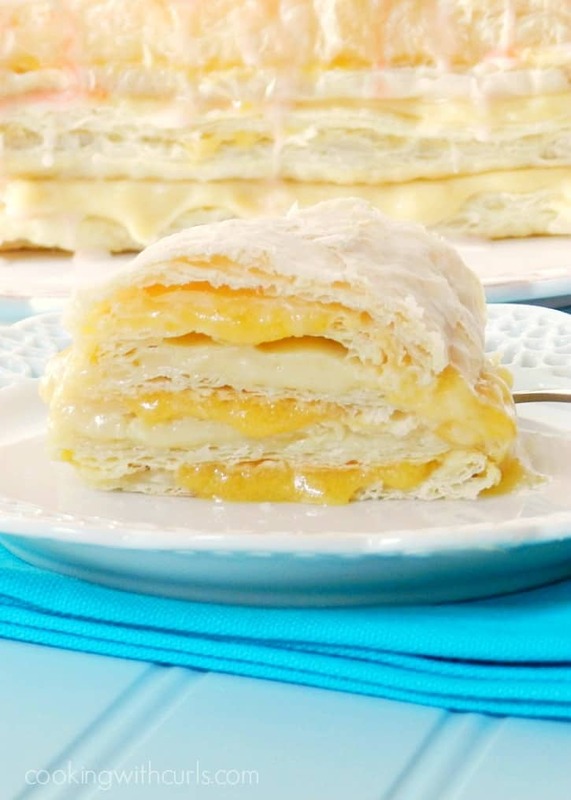 Rich vanilla pastry cream and fresh peach coulis are sandwiched between layers of puff pastry to form these incredible Peaches and Cream Napoleons! Bake in a preheated 400 degree oven for 15 minutes, or until golden brown. Spread peach coulis over one of the bottom puff pastry layers. Slice with a wet serrated knife.